One of the most popular shows running in the West End since 2005 is the jukebox musical The Jersey Boys, which tells the story, via the music, of the Four Seasons. A thoroughly recommended show if you haven’t seen it. It brought the music of the group to a whole new audience especially as they hadn’t had a UK hit since 1977. It was so successful that it was made into a film in 2014 and directed by Clint Eastwood. The name Four Seasons, and their falsettoed lead singer, Frankie Valli, have been well-known during the sixties and seventies, but the group also had brief success in America under an alias. Before the Four Seasons began proper in 1962 with Sherry, Frankie Valli had already been trying to make his name for almost 10 years. His first release was My Mother’s Eyes which was credited as Frankie Valley in 1953. The following year he formed his first band, The Variatones with guitarist Tommy DeVito. They stayed together for a couple of years but during that times changed their name and eventually settled with the Four Lovers. Their only American hit under that name was You’re The Apple of my Eye which stalled at number 62. They released seven singles under that moniker but success eluded them. In 1959 they began working with a producer and songwriter called Bob Crewe and whilst on tour in 1958 they were on the same stage as The Royal Teens who are best remembered for their American-only hit Short Shorts. That song was written by Bob Gaudio who Valli met and invited him to join the band. Bob Crewe had his own production company and in 1961 he signed them and changed their name to the Four Seasons. Bob Dylan wrote that song after his girlfriend Suze Rotolo went off to Italy to study at the University of Perugia and left him in New York and Dylan saw it as a separation. He said, “A lot of people make it sort of a love song – slow and easy going. But it isn’t a love song. It’s a statement that maybe you can say something to make yourself feel better. It’s as if you were talking to yourself.” Suze, who was an artist and civil rights activist, is the woman seen on the cover of Bob’s second album The Freewheelin’ Bob Dylan. 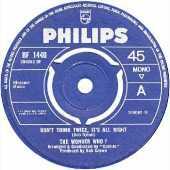 Over the next 18 months, The Wonder Who released three more singles; On the Good Ship Lollipop, The Lonesome Road and the final one, Peanuts which all failed to make any impact so they decided to give up with The Wonder Who and stick the Four Seasons.